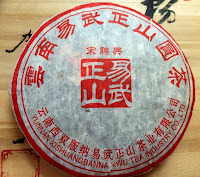 Back when the Yiwu Zhengshan Tea Company was getting off the ground, they first printed under the Yi Cheng(易盛) brand as well as the more obscure Song Pin Xing(宋聘興) label before they launched the wildly successful premium Douji brand in 2006. Song Pin Xing appears to have had just a short one year run in 2005. 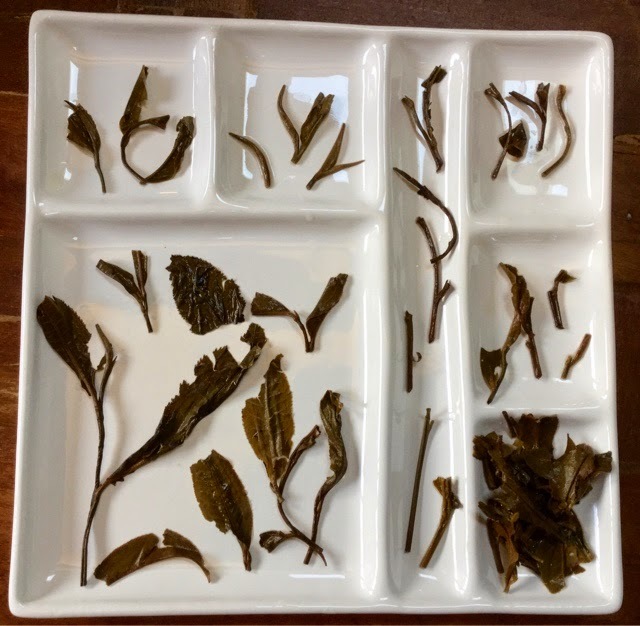 This wrapper looks similar to the Yi Cheng(易盛) which had been more readily available on the internet in years past- a frenzy started between MarshalN/Hobbes when they were still collaboratingto help us find better teas. If you are a Douji fan and have never seen this one before, don't get too hot and bothered. There's good reason why I consider this a taco tea. 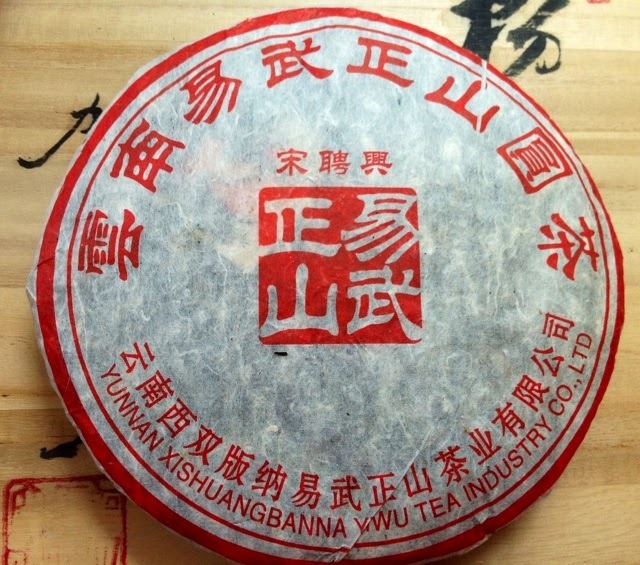 Seeing as how many times Yiwu Zhengshan is slathered on the wrapper, is this round cake way more Yiwu than the Yi Cheng? Lets brew! 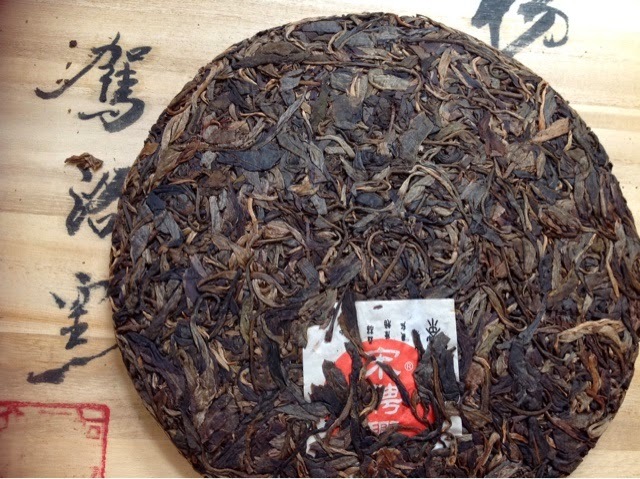 This red label being an autumnal production is not the most captivating Yiwu to be had. How do I know it's guhua? My test involves popping most of the stems apart afterwards- fibrous stems are a sure sign as spring productions are much more juicy and give with out much effort. Actually you can tell how woody the stems are on the raw cake without having to brew it up. The muted taste and weaker huigan of course complete the picture but I've also got that extra dry storage thing going on... But if you've got a sheng intolerance and you can glug it down, it's gotta be autumnal. By Douji standards, these leaves are a mess. There's more burnt black edges and stems. Compared to the '05 Yiwu Montain Bamboo, these leaves went through some rough handling. This Song Pin Xing entered my house summer of 2006 having been procured by a friend in Meliandao for about 10 bucks. I would have preferred the spring pick purple label but beggars can't be choosers. I know you youngsters absolutely hate it when I keep repeating that sodas were just a nickel back in the day. Ironically back in 2006, on a Sanzui post on this particular tea, a forum member called this an expensive tea for 70 yuan(!). Regardless of what these teas have become due to label and age premiums, I relegate this particular Yiwu in my pile of taco teas- tasty enough for the cost. It's mild enough that I can enjoy it anytime as my budget Yiwu option. If I had paid today's high price on this baby, I'd be disappointed. But at $10, it's all good. What a clever way to display the leaf!